In each generation, scientists must redefine their fields: abstracting, simplifying and distilling the previous standard topics to make room for new advances and methods. 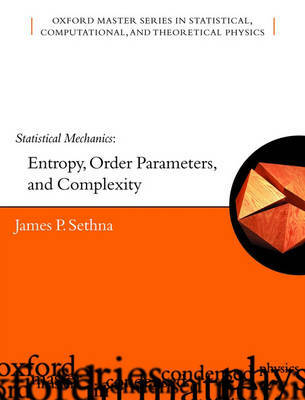 Sethna's book takes this step for statistical mechanics - a field rooted in physics and chemistry whose ideas and methods are now central to information theory, complexity, and modern biology. Aimed at advanced undergraduates and early graduate students in all of these fields, Sethna limits his main presentation to the topics that future mathematicians and biologists, as well as physicists and chemists, will find fascinating and central to their work. The amazing breadth of the field is reflected in the author's large supply of carefully crafted exercises, each an introduction to a whole field of study: everything from chaos through information theory to life at the end of the universe.